Forgive me if this review leans more toward an editorial at times. The watered down state of the power metal genre has been well documented over the past few years. Much to my disappointment, the accomplishments of well established veterans of the scene and exceptional newcomers has been cheapened by this phenomenon. For example, how many bands over the years have been compared to Helloween? Too many to count. So, Helloween releases the third installment of their Keeper of the Seven Keys saga, and I actually saw folks criticize the band for not sounding "original" enough. I wonder if these people would have had the same complaint had 21,764 albums not tried to copy that Keepers sound in the years separating the release of Keepers II and III? Frequency was formed in 2002 by former members of Swedish death metal act Lothlorien. Unlike their death metal background, Frequency play very standard power metal. Vocalist Glenn Laurén has a notable resemblance to S.L. Coe (formerly of Angel Dust and Scanner), but Laurén has a much fuller voice than Coe. Furthermore, he sings with conviction and passion for the music, very similar to Andy B. Franck of Brainstorm. Musically speaking, the guys definitely know how to play their instruments. The guitars are tight and fast, bordering on Bay Area Thrash in scattered places throughout the album. Given the death metal background of this band, the fast paced / thrashy guitar assault is exactly what I had expected. The heavier side of Gamma Ray, Grave Digger, Rage, and Iron Savior is a good measuring stick of how Frequency approaches their power metal. However (and this is a big "however"), the end result is nowhere near the top tier of bands in this genre. Aside from the catchiness of the opening track, Oblivion, and the title track, each and every other song just anonymously mixes together after awhile. I've held onto this disc for a few weeks now just in case I wasn't giving the album enough of a chance. Honestly though, I now get bored with the album by the fourth track and move along to something else. As my introductory paragraph alludes to, the power metal market is saturated right now. A band really has to deliver a knock out product (not neccesarily original, just really good) in order to be noticed. Yes, the singer is above average, and even the pure execution of the guitar performances is excellent. However, the arrangements on this album make me think that Frequency read the "How to Make A Power Metal Album" instruction manual right before they recorded this disc. Melodies are present, but they are plain, and have no lasting value. No one song can truly be called a killer track, with seven of the nine nearly indistinguishable from the next. I'm not asking for a band to reinvent the genre, use 47 instruments over the course of a song (Rhapsody, anyone? ), or be 100% original. Just give me something good. Unfortunately, the songs on this album don't beg to be heard again, nor do they achieve anything that hasn't been done better by dozens of bands before them. What I have written may sound harsh, but I do think Frequency are capable of a much better product than this. I am really a fan of the lead vocalist, and the individual music performance scream of seasoned and highly talented veterans of heavy metal. I'm just let down that the end result wasn't a more enjoyable album for me. If provided with an album's worth of stronger material, I know that this band could deliver an outstanding album. Since this is a new band entering a new genre (coming from death metal), I can completely understand an adjustment period for the guys to acclimate to this new genre and to each other. Also, this could explain why the end result was a very standard or "safe" power metal album. I honestly do think the talent is in this band to produce a gem, and so it troubles (and frustrates) me a bit to score this album so low. However, talent alone does not warrant a high score. 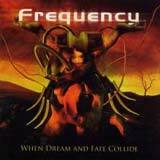 If Frequency can continue to grow creatively, they have the raw talent to make this album look like just a mere stepping stone a few years down the road. Despite the score, this is still a band to stay on my radar.